Brain function requires substantial energy. To be able to think clearly, we need to eat sufficient calories, and it is best to choose foods that are digested slowly (for example, proteins and healthy fats, rather than simple carbohydrates and sugar) so that the level of glucose in our blood is fairly consistent. Drinking adequate water helps nutrients circulate in the bloodstream, and there has been considerable research about the brain’s specific nutrient needs (for example, omega-3 fatty acids have been found to be especially important to the brain). 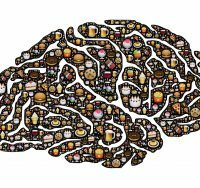 Eating healthy meals and avoiding complex tasks when we are very hungry can help our brains work best. Nathalie Boutet, founder of the Neuro Family Law Institute, regularly reminds her clients to pay attention to their own nutrition, and to get enough sleep before stressful events.